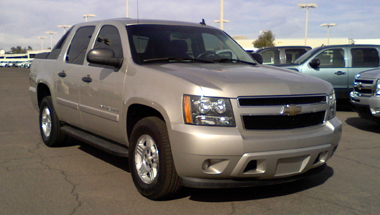 The Chevy Avalanche is one of the more versatile vehicles on the road today. It blends the comfort and passenger capacity of an SUV with the cargo flexibility of a pickup truck. While these two main attributes are also associated with full-size crew cab pickups, the Avalanche goes one step further with its distinctive fold-down midgate. It is a four-door, five or six passenger SUV sharing GM's long-wheelbase chassis used on the Chevy Suburban and Cadillac Escalade EXT. Unlike the typical pickup truck, the open bed of the Avalanche opens to the back seat area via a folding panel and removable rear window. The Avalanche was launched in 2001 as a 2002 model on the GMT800 platform. First year Avalanches featured light gray plastic body cladding, intended to provide visual distinction from the Suburban/Yukon XL. Avalanche also gave the public an advance look at the next generation with Chevy Avalanche Accessories, front fascia designs for the entire GM line. A full-length chrome strip splits each lamp assembly and the truck grille with a gold Chevrolet bow tie in the center. The hood and fenders featured aggressive folds, in contrast to the soft box of the other GMT800 models. There are three trim levels: base Avalanche LS, midgrade Avalanche LT and plush Avalanche LTZ. All models are equipped with a 5.3-liter V8 (310 horsepower and 335 pound-feet of torque) that's matched to a six-speed automatic transmission. Versatility is what makes the Avalanche so desirable. It offers an 8,000-pound towing capacity, making it an excellent choice for pulling an enclosed car trailer or a fairly big boat. 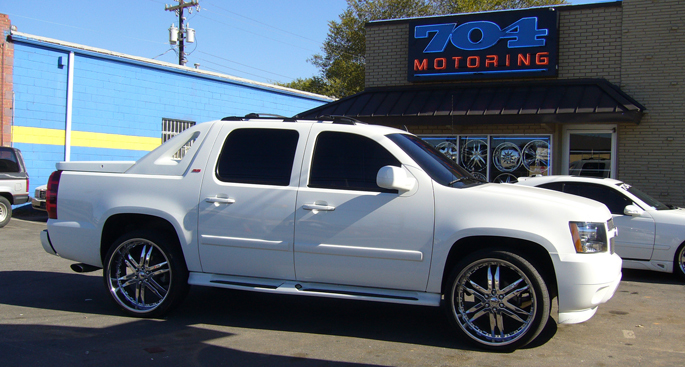 The 2009 Avalanche comes with a six-speed automatic transmission, replacing the four-speed automatic on the 2008 model. New for 2009 is an integrated trailer brake controller, more features for the LTZ model and more options for LT versions. Later models introduced the version of the Vortec 5.3-liter V8 as the engine is now capable of running on E85 ethanol. When the 5.3 is running on normal gasoline, it produces 320 hp (240 kW) and 335 pound-feet of torque whereas its output rises to 326 hp (243 kW) and 348 pound-feet of torque on E85, up from 310 hp (230 kW) and 335 pound-feet in 2009. For the 2010 model year, the 6.0-liter was dropped from the Avalanche lineup which left the 5.3 V8 as the only engine available for the truck. In its final year, the 6.0-liter produced 366 horsepower (273 kW) and 376 pound-feet of torque. The interior of the Chevy Avalanche breaks with Chevy tradition much more than the exterior does. A large, round tachometer and matching speedometer dominate the gauge cluster, complemented by four smaller dials reporting information vital to the operation of a truck capable of hauling heavy loads or pulling large trailers or transporting as many as six occupants. The center stack houses controls for stereo and climate management, two power points, and buttons for optional features such as the power adjustable pedals. The optional leather upholstery and other materials favored durability over luxury. 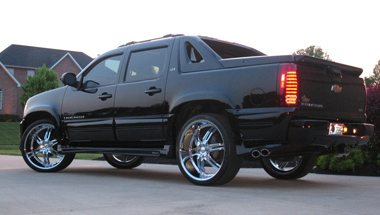 The Midgate is what separates the Avalanche from other pickups. With the Midgate and bed cover in place, you have a four-door truck with a huge, lockable trunk. Fold the seats down and the trunk gets even bigger. Lift off the bed covers, fold the seats back up, and it's a pickup with a short bed. Finally, fold those rear seats and the Midgate and remove and stow the back window and bed cover, and it's transformed into an open-air hauler with room for all sizes and shapes of cargo, from regular-size sheets of plywood to a brace of off-road motorcycles or an ATV.